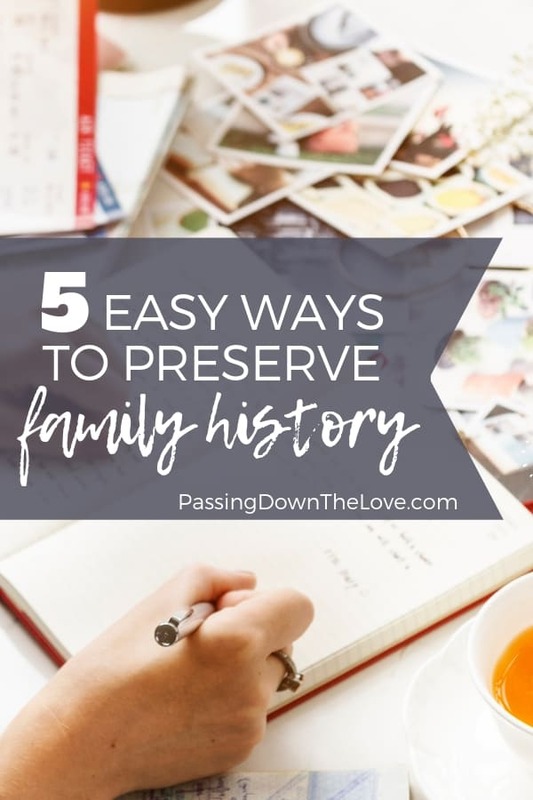 5 Easy Ways to Preserve Family History for Future Generations. Every life has a story wrapped up in memories and emotions, not just “facts”. Pass those stories down through the generations. 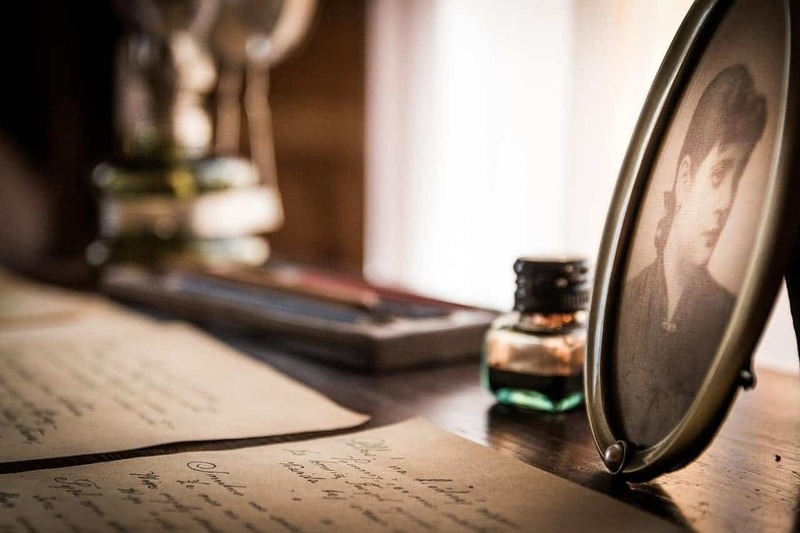 Here are 5 easy ways to preserve family history. Preserve family history and memories for future generations. Curiosity about family history, where we came from and how we became what we are today, is a part of human nature. By finding ways to preserve family history, future generations can know what brought them here. They will have a better understanding of their past. It’s not just about knowing your great-great-grandmother’s name. It’s about understanding the lives, struggles, joys, and events that shaped their world, and ultimately, your world. Secrets shared between brothers and sisters. Activities like backyard barbecues and vacations with cousins. A first car, first date, or first kiss. Serving in the military, building a career, saving for that first home, and raising children. All of these combine to shape us as it shaped those before us. Preserving these stories and memories for future generations is a gift that helps bring richness and depth to your family’s history and an appreciation for your heritage. Preservation of history can be accomplished in many ways. Preserve documents, photos, and slides by transferring them to an electronic medium – your computer, “the cloud”, a DVD. Pictures and documents can be scanned directly to the computer, using a regular scanner or a handheld device for mobile use. If they are in fragile condition, consult a professional for advice on preservation. Slides can be converted to digital images using a converter like this Epson scanner that I use. For more information, you can read this post: Avoid Regret: Digital Photos Save the Day. The bottom line is, preserving family history through a digital process will help to ensure the survival of these treasures in the event of disasters such as fire, tornado, hurricane, or flood. Purchase a journal for the older adults in your family. Some journals are designed to present questions about the past and give the writer space to answer and discuss their lives. If they are unable to write their answers, send a family “reporter” to document their responses. Memory books can be created from photos that have been scanned using services like Shutterfly or Snapfish. StoryWorth even has an audio option for those who rather speak their memories. With this service, a weekly question is sent to the storyteller who can submit their answers by email or by voice and at the end of the year, a keepsake memory book is created from the submissions received. No matter the approach, creating a memory book can provide a glimpse into the events, feelings, and memories of your family members from their perspective, in their own words. Gather recipes from your family and create a family recipe book by using something already available like this organizer , which can store recipe cards, photos and has a place for your own handwritten recipes. Recipes and pictures can also be posted online, like Grandma Grace’s Christmas Tree Cookies. Recipe cards can be sent to your older family members, asking them to share the recipes that they know are traditional or special to them and the family. These can then passed on to sisters, brother, children or cousins. A treasury of family recipes would even make a wonderful gift! 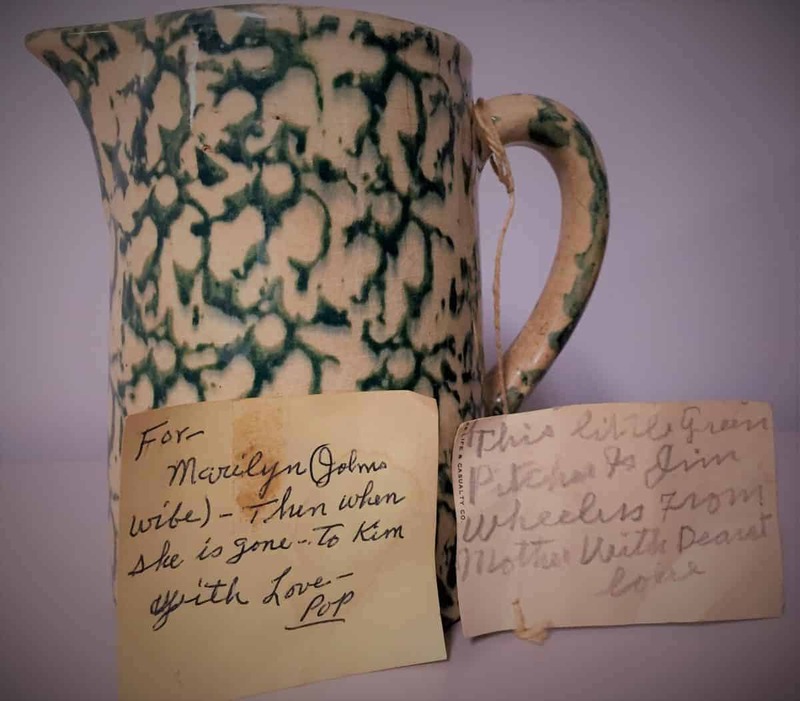 This little pitcher belonged to my Great-grandmother. It was passed to my Grandad, my mom, and now to me. I know because it has their notes inside, in their own handwriting, telling me so. Having this little pitcher is special. Knowing that my Grandad (Pop) was thinking of me when he wrote this note makes it even more so. It’s probably time for me to write my own note designating the next one to continue caring for this special family memento. Most older folks enjoy talking about the past and are happy to share information about the “things” in their family. Where did they get that old clock on the mantle? Who has owned that antique kitchen table? Ask questions and discover which “things” carry important memories and are considered special to your family. For more information about the stories of family and things, check here. Spending time traveling together gives an opportunity for conversations that may not take place in other circumstances. Subjects are rarely discussed in detail at simple family dinners. However, travel experiences, such as visiting a hometown together, can bring back those memories. Otherwise forgotten moments remembered and further exploration of the past results. Seeing where Grandpa grew up, meeting people and hearing stories from those who knew him “back when” may provide a clearer picture of how things really were in his past. Weekend getaways or extended vacations can result in an appreciation of each other’s personality and perspective. To preserve family histories for future generations, a conscious effort should be made to gather pertinent information about our past. Make an effort to get to know the older generation. They have a lot to share. They have information which can make a positive impact on individuals of the future. Having this information could make a significant impact on the current generation – you. Have you made an effort to talk to your parents or grandparents about their past? Here is a list of questions to get you started! Please share your experiences. I would love to hear from you! This is great advice. There are thousands of things I would like to ask my parents, grandparents, aunts and uncles — if only they were still alive. If the older generations in your family are no longer here, maybe YOU are the older one who should be answering the questions? I’m very lucky and grateful every day that my elderly parents are still here and able to answer. It won’t be long till that will no longer be the case. Thanks for reading & commenting! Edit: I looked at your blog — I love the post about your 30th year & your aunt and uncle. Like they were on one long camping trip… You are a very engaging writer! I’ll be checking in for a good read every once in a while… thanks again!